I am an Artist living in Utah. An avid outdoors woman and self-taught artist, Diane paints what she loves best: wild animals, Montana Mountains, and farm animals. She is praised for her bold brushstrokes and vibrant colors which make her work come alive. I am a Juried Award Winning Published International Artist with collectors all over the world. 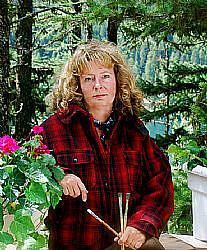 I am a member of Women Artists Of the West, Oil Painters of America, American Impressionist Society and The Five Graces .